First of all, let me say hello from Uppsala, Sweden, where the HistoCrypt 2018 is currently taking place. I have the honor of being a member of the steering committee of this event. 55 people are attending HistoCrypt 2018, including many readers of this blog, like Norbert Biermann, Armin Krauß, Jerry McCarthy and George Lasry. Already on the first day, I heard several talks that inspired me to blog posts I might write in the near future. Program chair Beáta Megyesi and her team are doing a great job in organizing this event. The most important message of HistoCrypt 2018 is that crypto history research is making progress. More and more skilled people get involved in this field, while new research areas are explored and new infrastructure is developed. My two contributions to this year’s HistoCrypt, apart from committee work, are a presentation I will give about codebooks/nomenclators and a poster I have presented today. I will write more about this in a later post. The current HistoCrypt is mainly a scientific event, but it has been decied that next year’s issue will be extended. Especially, it will feature a presentation track for people without a scientific scope. 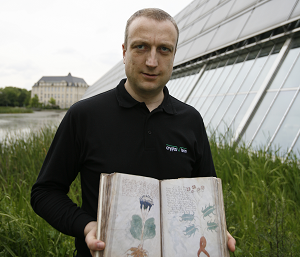 So, if you are a crypto machine collector, a crypto history book author, a journalist with an interest in crypto, a Voynich Manuscript enthusiast or just an interested reader of this blog, please consider handing in a presentation proposal. The application process for this track will be simple and you will not be required to write a paper for the conference proceedings. The speaking proposals will not be evaluated based on scientific considerations but on the attractivity of the topic and the competence of the lecturer. In case you are more interested in a publication with a high scientific value, you still can hand in a research paper. In my view, the highlight of the first conference day was Craig Bauer’s presentation about famous unsolved and solved cryptograms based on his latest book Unsolved! (this book, which is written in English, has a similar content as my German book Nicht zu knacken). As readers of this blog might remember, Craig published a solution of the second Zodiac Killer cipher when he appeared in a History Channel documentary last year. Many crypto experts criticized him for this because they believe that this solution is not correct. 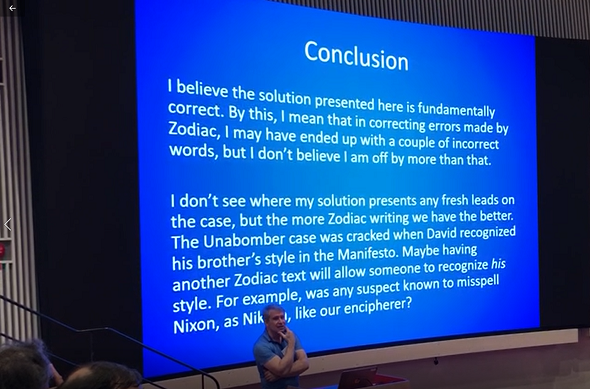 According to Craig, the Zodiac Killer used a substitution cipher with backwards homophones (i.e., there might be several ciphertext letters that stand for the same plaintext letter, and there might be several plaintext letters that stand for the same ciphertext letter). In addition, Craig thinks that a part of the cryptogram is simply gibberish, which is the reason why frequency analysis and other codebreaking tools don’t work very well on the message. Of course, it would be nice to have a research paper about Craig’s solution published in Cryptologia or another scientific magazine, but Craig said that he is currently not working on such a publication. This bible was bought in England. right for another bible. AIAU. Good job, you got it but you missed the date. fill in the known/guesed letters. Who can solve the cryptogram I made? I dedicate this to Bill Lann and Jew Lee Briere. Two dedicated hard working cryptanalysts, they sacrifice all their free time for their country. The problem with these symposiums and the numerous “Book Deals” is that they are not really doing it for me…..
One NSA “Fellow” Dave Oranchek has already asserted that he cannot break them, and offered discussions that ask the question “When do we know when to stop trying to solve them?” and has a pretty good following explaining that critical fact to everyone that he meets. That he cannot solve them, and that we should stop trying because ? The same “Fellow” on the show “Hunting the Zodiac”, Craig Bauer, has been instrumental in using the most advanced cpu tech to also assert that he cannot solve them. With this monumental opportunity on national tv you would think that they would find these associates crucial to solving it all for the ratings, but instead barely touched on the ciphers, instead focusing on strands of patterns that they had made up software for years before the show, offering the chance to see “new” info. Didnt happen then either? Computer makes some patterns appear, and the interest disappears. Instead as a consolation Kevin Knight, Craig Tester, and D. Oranchek decided again what there was for us to see about their discoveries, behind their secretive codebreaking partnership……he offers yet another online system that can “write poetry, like a serial killer”, using his computer to generate the lines of these Mikado Haiku’s at any time. Geht man bei Bauers Lösung in die Tiefe, so ergibt sich für mich jedenfalls das Bild, dass sie sich nicht wesentlich von meiner, jedenfalls der Wertigkeit nach, unterscheidet. Ich jedoch toure nicht durch die halbe Welt und verkünde, den Z340 gelöst zu haben. I have something better no one has seen yet. I feel embarrassed for this guy. It’s one thing to produce something silly for a TV show, but quite another to try to defend it to people who should actually be more interested in the facts than being on TV. That he speaks with such certainty is really annoying, especially given that he will never submit a paper on this topic to his own journal, Cryptologia, as it would be ripped to shreds.